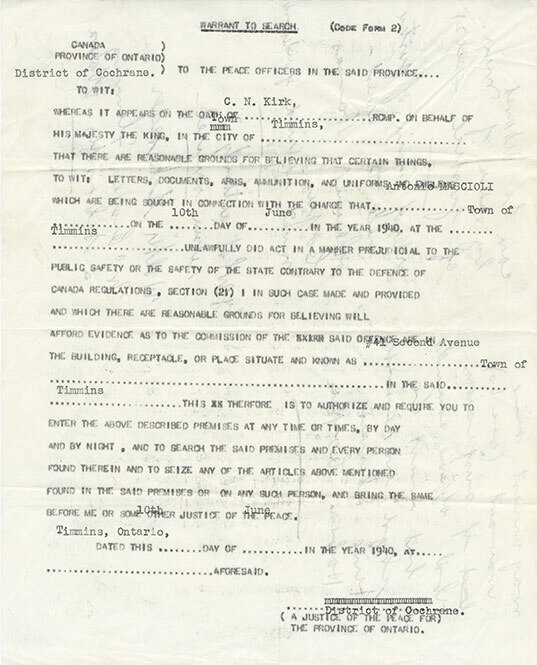 Warrant to search Antonio Mascioli's home in Timmins, ON, June 10, 1940. Warrant was issued by the Justice of the Peace for the Province of Ontario, District of Cochrane. The back of the document has notes written in pencil, perhaps by Dan Mascioli, the son of Leopoldo Mascioli (Antonio's brother). Dan worked on his father and uncle's objections to internment. Under the Defence of Canada Regulations (DOCR) the Minister of Justice had the ability to intern any individual suspected of acting “in any manner prejudicial to the public safety or the safety of the state.” Under this regulation, habeas corpus – the need to produce evidence against an internee – and the right to a fair trial were suspended. As such, many family members recall their loved ones being arrested and taken without a warrant or other legal paperwork. However, in this case, a warrant was issued to search the home of Antonio Mascioli for "letters, documents, arms and uniforms", based on the "oath of C.N. Kirk, RCMP" that these materials were present. It is unclear if like warrants were produced in other cases, or if not, why Mascioli's situation would prove an exception.